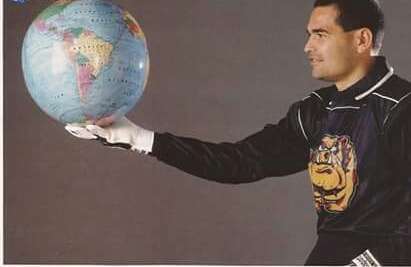 Jose Luis Chilavert is former Paraguayan goalkeeper and one of the greatest in history, selected as the best keeper in world in in 1995,1997,1998 and 1999. A regular taker of penalties and free-kicks at both club and international level, he has enjoyed great success in his club career and was the first choice goalkeeper for his country for well over a decade. Chilavert started his club career at the age of just fifteen with his local club Esportivo Luqueño, and moved on to Guaraní three years later. He won the first major honour of his career with Guaraní when the club claimed the Paraguayan League Championship in 1984. In 1985, Chilavert moved to Argentina to join San Lorenzo and enjoyed three years with the club before a transfer to Europe took him to Spanish club Real Zaragoza in 1988. Failing to settle in Europe, he returned to Argentina in 1991, joining Vélez Sarsfield. It was there that Chilavert enjoyed the greatest successes of his club career. Having played for Paraguay in the Copa América in both 1991 and 1993, his first major honour with Vélez came in the form of the Argentinian Closing Championship in 1993. The following year brought success in the Copa Libertadores and the Intercontinental Cup, and after a double of the Opening and Closing Championships in 1995-96 Chilavert was named Argentinian and South American Footballer of the Year. Following a third success in the Closing Championship in 1998, Chilavert appeared in his first World Cup and was one of the best goalkeepers in the competition, helping Paraguay to reach the last sixteen where they lost narrowly to France. Two years later, he returned to France to play for Racing Club Strasbourg where he won the French Cup in his first season. Chilavert appeared in his second World Cup in Japan and Korea in 2002, and despite missing the first game through suspension again played an important part in Paraguay's progress to the second round. Returning again to South America to play for Peñarol in 2003, it seemed that his playing career would come to an end with success in the Uruguayan League but in 2004 he decided to return to Vélez for one final year. Sorry for repost this, but the era is causing an inaccuracy, he should not have this level of fka for years in which he did not take anything, also the era is extremely long. Should be 1994-1998 (tbh i don't feel that this can represent the year 1999), besides all the bull*hit that Chilavert has done in our league, the guy was amazing, really a son of b*tch (in te good sense ) when he faced River he was a real problem, but after 98-99season he was a shadow i've remember how Trotta shut his mouth with that penalty in the Apertura 00'. AGI: 73 -> 75 (for the years 1994-1998) after that white numbers for sure. Would be great to have a set for him in his SL years, probably the next year i will come with something since its a little bit difficult find games from SL in that era.